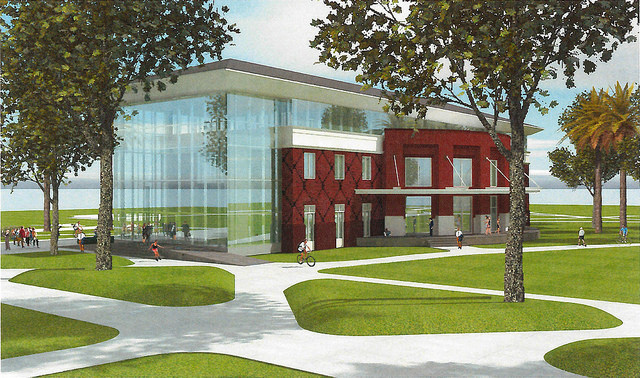 Artists’ rendering of the new Marshall & Vera Lea Rinker Welcome Center. One year after arriving at Stetson University, President Wendy Libby crafted her vision of the DeLand campus in a 2010 master plan. Key considerations centered on the student experience along with teaching spaces and residential life. A half-decade later, as approximately 1,073 new students are still finding their way from the Commons to Edmunds Center and points in between, that vision is very much in focus. The total number of undergraduate students is roughly 74 percent higher than the incoming class of 2009, reaching Stetson’s goal a full year ahead of schedule. In addition to growth, those students will see change that will help them learn as well as heighten their level of comfort. “Once we determined that the strategy was to grow in size and quality, and there was some success, we were able to ask: ‘How do we reinvest in an already really wonderful university?’” said Libby. In May, Stetson’s Board of Trustees approved more than $35.7 million in capital improvements, with most of the funding earmarked for projects in DeLand. Work began during the summer and over the next 30 months or so $45 million worth of construction will occur, said Bob Huth, Stetson’s executive vice president and chief financial officer. New trees and plants will decorate the parking lot next to DeLand Hall. That statement was made even before Huth was able to divulge perhaps the university’s most recent news related to construction: the planned construction of an aquatic center on a 10-acre tract owned by the university at nearby Lake Beresford. By virtue of a $6 million gift from Sandra Stetson Martinuzzi — a great-granddaughter of Stetson’s namesake, John B. Stetson — a water research facility will be built along with a home for the university’s women’s and men’s crew teams. The resulting cross-disciplinary site will touch sciences, the arts, literature, philosophy, civic engagement, sports and recreation. The announcement added to an already active scene. From a financial perspective, Huth calls the timing for all the construction activity both fortuitous and well planned. He cited private donations from a continuing comprehensive campaign and the “opportunistic” refinancing of bonds as chief reasons the university can comfortably pay for the projects. Essentially, Stetson was able to leverage a sound financial position. This work represents the first major construction on campus since 2011, when Stetson began building a $6.7 million athletics complex. Notably, when it comes to campus construction nationwide, Stetson isn’t alone. A steady upswing in activity is apparent as the general economy continues to improve. In 1995, American colleges and universities spent a total of $6.1 billion annually on construction projects, according to a study by College Planning and Management. Construction activity peaked at $15 billion in 2006 before spending virtually ceased during the subsequent recession. In 2014, spending had risen to approximately $14 billion, marking a fourth consecutive year of increases, College Planning and Management data reveals. 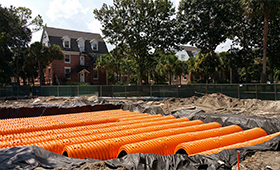 These orange tubes are part of an underground drainage system that will direct water back into the aquifer. To a large extent, that incline mirrors student enrollment. In fall 2015, approximately 20.2 million students are expected to attend American colleges and universities, an increase of nearly 5 million since fall 2000. Stetson is not only seeking to remain competitive, but also stay ahead of the curve. The intent, Libby affirms, is to maximize reinvestment in the university’s highest priorities — with an eye on everything from learning outcomes and faculty research to the recruitment of future students. The Carlton Union Building, or CUB as it’s popularly known, opened in 1957 and serves as the primary student dining room — but it was no longer configured in a way that college students do their work and have their fun, notes Libby, who made it a highlight of the 2010 master plan. 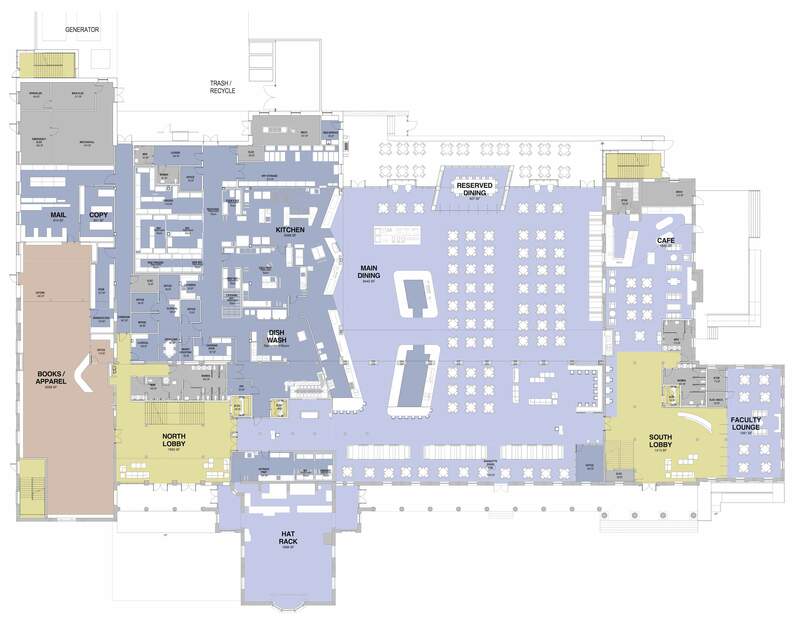 Floor plan for the main level of the CUB. A 40 percent expansion will bring the space to approximately 80,000 square feet and feature new roofs, plumbing, heating, air conditioning, lighting and electrical systems. There will be 40 percent more seating in the dining room, renovated restrooms and more elevators, among numerous other new components. The CUB’s second floor will include a large student lounge and office space for the Student Government Association and student clubs and organizations, among other areas. Staff offices for those who partner or work with students also will be located there. The north wing of the building will contain a new retail center, while the east wing will have a patio dining area overlooking green space. The renovations began over the summer and are expected to be complete in early 2018. The new Marshall and Vera Lea Rinker Welcome Center is a three-story, 24,000 square-foot building located in Stetson’s historic district. The first floor will consist of reception and waiting areas, presentation and interview rooms for prospective students and students meeting with corporate recruiters, and space for alumni to gather. The second floor will include a one-stop service area, encompassing functions of the registrar, bursar and student financial planning, and the office of career and professional services for current students and alumni. A recruiting operations center will operate on the third floor. Site work and a parking area for the building is scheduled to be completed in early fall, with construction continuing through the fall and spring semesters. Artists’ rendering of the new Welcome Center from the southeast. Al Allen, Stetson’s associate vice president for Facilities Management, labels the center “green.” Amid the construction, he asserts, the Stetson core value of responsible stewardship of the natural surrounding hasn’t been lost. For example, by opting for a three-story structure instead of two stories, less land is consumed. The metal roof won’t require replacement for 50 years, and the materials can be recycled. The brick-clad building “celebrates and complements” its historic setting, and brick by nature is low maintenance. An extensive use of glass reduces the need for artificial light, while the LED light fixtures used throughout the center conserve energy. Moreover, the flooring is being manufactured from recycled carpet. The parking lot will employ solar light and be made of concrete, not asphalt — concrete generates less heat. Underwater storm chambers will capture rainwater, which eventually will filter down into the aquifer. “The whole thought is to build a building that provides a great experience for prospective students, current students and alums. But with a building that is inherently efficient,” Allen says. For good measure, other recent environmental initiatives throughout campus include comprehensive re-lamping: the installation of efficient lighting and electronic ballasts that help limit energy consumption, solar for some outdoor lighting and LED lighting in parking areas. An increased use of grey water through water-wise landscaping and rainwater harvesting is another recent environmental initiative. In addition, Stetson has begun working with an outside firm, Cenergistic, to become even more energy conscious. Cenergistic works to optimize clients’ infrastructure, improve internal processes and change behaviors to reduce energy consumption. A master plan is taking shape. Indeed, a vision five years in the making is being realized. And, while the work isn’t complete, Stetson’s president is already looking ahead. Find more photos and information on Stetson’s construction website: Stetson.edu/construction.